Just bought S560 (2018) with 20" wheels Pirelli performance tires. Drove 100 miles or so. I am not happy at all with the ride & noise. My dealer was willing to swap with 19" wheel with non performance tires as I was struggling to make a decision. it is my 6th S class and i know it is the worst ride experience due to the 20" performance tires. Conti DWS6 is the best solution keeping the same 20" Rims? or Switch to 19" wheels with Michelin run flat tires at dealer? My 2014 S550 had 18" run flat Bridgestone tires, and they were awesome. HELP! The more sidewall you have on the tire, the better the ride. The 18" is best. Of course regular tires will perform better than the RFTs. Going from 18” wheels to 20’s must be a comfort shock. Why did you do that? I know that several guys here will claim that their cars with 20” wheels and run flat tires ride “great,” but compared to what? A 1980’s Corvette with the performance suspension? And all this crap about “performance” tires. On an S Class Sedan??? Why anyone living in the U.S. would have a need or a desire for high performance tires, beyond the basic, most quiet and comfortable all season tires that are available today, is just beyond me. What are thes guys doing, taking residential corners at 60mph? Taking their cars to the track—yeah, right. It’s all about the fact that MB and most other makers have found one more way to squeeze more money out of their customers, by convincing so many that bigger wheels—at horrible option prices, with ridiculous, shallow sidewall tires—that cost a fortune and can be damn near impossible to find if you need one in a hurry, will somehow make their’s bigger than mine. What a load of BS—and don’t even get me started on the “AMG Line” option! No sir! An S450 or S560 with 18” wheels and all season, non-run flat tires rides like a dream. Add MBC and it’s the best riding car on the planet. Sorry you are having problems. Maybe the dealer will swap out those 20’s? So when the Apocalypse comes, we can get "outa town quick"
Nah, MB has also convinced many that they need a G65 with 20” load rated tires for that. I am in total agreement. I have no idea why some folks are enthralled with the huge wheels and pay SO MUCH more. I think it's nuts. I have Bridgestone RFT's on 18" wheels on my 2014 S550 and am very pleased even though I realize that the non RFT's would be even better. But I want the trunk space. My new 2019 S450 is now held up in Baltimore since July 11 but will be at the dealer as soon as MBUSA releases the 2019's. It looks like it will be early to mid August. In any case, I also have the standard 18 inch wheels on it as well. "Give me comfort and quiet ride or give my no car"! Just swap for ALL SEASON. I have Mich A/S 3+ and they are super quiet. I airmatic between w222 and w221 is almost the same and these tires ride great. Also, I had 19's first, and going to 20 and a better tire kept the ride quality just as good. Also, check your tire pressure, maybe it's over inflated. I have the Conti DWS6 tires on my car and they ride great and are very quiet even in the 20" size. Is the ride better than 18" tires, probably not, but not that much of a difference. I had an S550 with 18" Michelins that rode smooth as silk on Airmatic but the 20" wheels with ABC rides just as good. Could be ABC smoothing the ride out. My experience is with the W221 chasis. Does anyone know if 19" or 18" wheels will clear the calipers on an AMG car? That wheel design will never get old to me. I swapped from 20" Pirelli P Zero RFT factory tires to Conti DWS6 and the ride was quiet and smooth. I blew out a Run flat tire within the first couple of weeks and after the switch zero issues with potholes. Stay with the 20" IMO. Comfort is great and the tires are cheap and last long. Or the Michelin A/S 3's as Jason stated. Both solid choices! I beg to differ. While wheels can't be large enough for some, in general people are not enthralled with larger wheels. It is simply how cars are designed these days. The reason why is because the shape of cars has changed for pedestrian safety, fuel efficiency and other design criteria. Material science and technology has changed so much that an 19" tire today can provide better comfort than a 16" tire 25 years ago. Some of the reasons why naturally aspirated engines and manual transmissions are more or less extinct so dwelling in the past provides no reference to today. Apples and oranges. The design of the S-Class is also with larger wheels in mind so 20" don't look large as they would on a W220. 18" wheels barely clear the brakes and 18" aftermarket wheels may not even fit. 19" really is the minimum wheel size on a sport package S-Class. Wolfman, I definitely respect your opinion, but I don't think anyone can convince me that the 20" wheels is as comfortable as the 18". And, I think the 18" wheels on the S Class look just fine. Anyway, to each his own. Personal preference matters most of course and you have a beautiful car! I prefer the sport package with 20” wheels but that is my personal taste. My point is that there isn’t necessarily a sacrifice in comfort by going with larger rims and neither is it an obsession to go big. Sign of the times that cars are designed different than they used to be. 18” vs. 20” both with either conventional or RFT’s, the 18” will be more comfortable. No contest. 18” RFT vs. 20” conventional my bet will be on the 20” in terms of comfort. The reason is that, apart from the design, it is the side wall strength that makes the RFT a run flat. In that respect a low profile tire is actually easier to give it side wall strength than a same size tire diameter with a smaller rim. More side wall equals more high strength side wall to prevent collapse in case of a flat. My issue is most conversations on this forum is that there are too many false assumptions. What is disregarded are the tire types, tire pressure, tire brand and the rims themselves. Last but not least the type of suspension. Last edited by Wolfman; 07-29-2018 at 04:58 PM. Thanks my friend. I understand. There is usually a break in period of 500-700 miles. Run them a bit longer, I've got the same tire and they run good. What size tires are u running with the 20s. I have a 2015 s550 4M and I thinking a out 20s but I'm hearing sizes all over the place. I just changed my 20" Pirelli Performance Tire (245 35 20 front, 275 30 20 rear) of 2018 S560...some people posted why in the world i chose this in the first place. I really like other options of this amazing S560, and that particular s560 had 20" wheel option only. Asked them to change at first, but they are not compensating for $1275.00 package when i downgrade, so i asked around, by popular votes, i tried for 100 miles plus, don't never listen to non Mercedes drivers..lol. My dealer changed to 19" multispoke wheel, run flat Michelin (245 45 19 front 275 40 19), a night and day difference, not as smooth as 18" wheel, however I like 19" wheel even better than 18" since I do have comfort and sports wheel. YES do not get any larger than 19" if you want the comfort, it defeat the purpose of silky traditional S class ride if you know what i mean. Agree with most of the above but how about this 18" wheel on E-Bay that is supposed to be mfg. by Stuttgart ?? Hey Chuck, that 18" wheel is looking great! I've never bought wheels before for S class, this Gorgeous wheel with 18" Bridgestone run flat tire sets (non performance) would work perfect, Tire cost $315 or so per piece, MB dealership has them and they got the best price. Just to confirm the Michelin pilot sport A/S 3+ do not come in 245 correct? 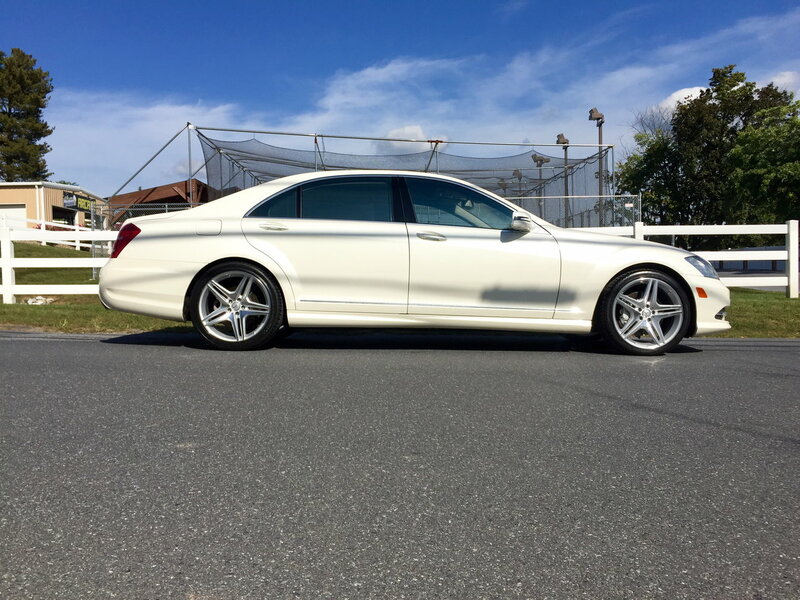 I am looking for a decent all season non run flat and i was leaning towards those over the DWS but wanted to stay with stock sizing b/c of the wheel and tire warranty and didnt want them to try and void it due to different size tire ie 255.
my s550 is rwd with 20 in amg wheels. Last edited by Detailingdoc; 08-08-2018 at 03:38 PM.